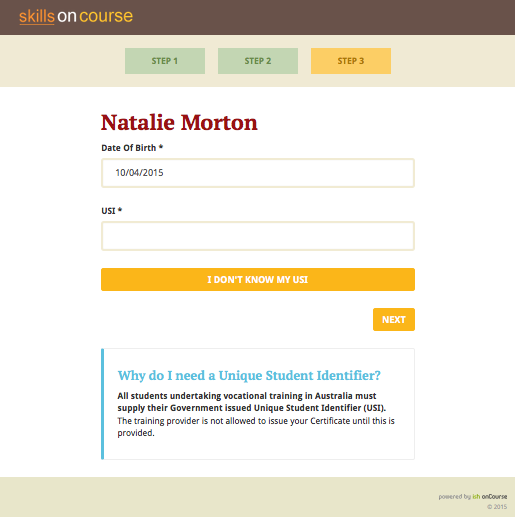 On 1 January 2015 the Australian Commonwealth government introduced a Unique Student Identifier which will be issued to every student undertaking vocational training. Once a student has been issued a USI, they will supply this number to any RTO where they undertake training, be they short one day courses like First Aid, year long full Qualification programs or anything in between. The training they undertake will be reported back to government through mandatory AVETMISS reporting and a combined training transcript created for the student showing all training attempts and completions undertaken throughout their life. If the student declines to provide their USI, the RTO is not permitted to issue their Statement of Attainment or Qualification on completion of training. Eventually a USI will be issued to every child starting primary school and every student at university. The USI is similar to existing identity systems already in place in Australia: medicare number, tax file number, driver's license, etc. but it is not printed on an identity card and it is illegal for RTOs to print them on student cards or certificates. The USI can only be issued in an automated fashion by the USI agency in response to a request from a student who comes with certain identification papers. Medicare cards, driver's licenses, birth certificates and passports are probably the most common forms of identification which can be used. Students without any official identification papers can be issued a USI though a manual request process. The USI legislation puts certain limitations on how the USI can be used and how it must be reported. The USI cannot be printed on certificates. None of the default certificates or transcripts in onCourse include the USI. The USI must be verified by the RTO. onCourse has a special feature to automate this process. You may not issue a certificate to a student until you have their USI and have verified it. onCourse will allow you to create Certificate records but not print them until the USI is verified. You can override this behaviour with the appropriate administrator rights, but you must then ensure you have implemented another verification process in your RTO. If you are creating a student's USI on their behalf, you can not store the identity documentation on a student's record permanently. You must discard it once you have successfully obtained the USI. The USI data is exported in all AVETMISS 7 flavours. If a student enters their USI online, or you enter it manually in onCourse the USI will automatically be verified against the USI Agency system. In order for this process to work we will require a special authorisation key called an AUSkey that has been linked to your RTO. The verification system is not available to onCourse community edition users who don't have a support agreement with ish. You can still capture the USI within onCourse and report it for AVETMISS but you will not be able to take advantage of the online student self-service process or the automatic verification process. Community users can verify their student's USIs manually using the USI Agency RTO portal. Most students will be going through the process of creating a new USI. 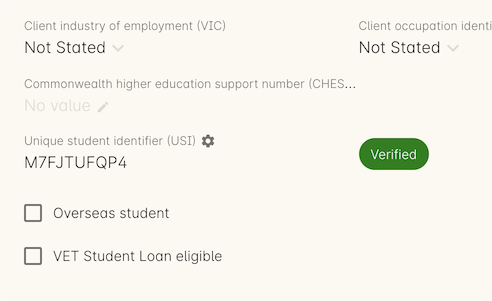 Once they complete this part of the process, we will then take that new USI and verify it against their first name, last name and date of birth as supplied on enrolment. 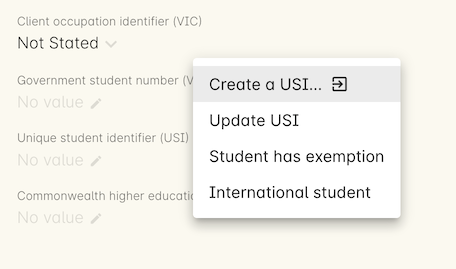 If the USI doesn't validate (possibly because the student used a dummy date of birth on enrolment, or a shortened version of their first name) then they will be prompted to update the incorrect data in onCourse to match their USI, so we can pass the USI validation process. Every Monday morning, all recently enrolled VET students who have not supplied you with their USI will be sent an automatic reminder email on how to complete this process and why it is important they do so. There is a customisable and that runs this process which you can edit to meet your preferred business requirements. A student who doesn't complete this process or can not validate their USI will be flagged in onCourse for you to follow up. Obtain an AUSKey from the Australian Business Registry, If your organisation lodges tax electronically to the ATO you may already have an AUSKey. Register your AUSKey with the USI Agency using this form. If you don't get an email confirmation, follow it up with the USI Agency directly. Only once your AUSKey is registered can you use the built in validation tools in onCourse. Customise the onCourse enrolment template and USI reminder template and script so the wording and frequency of the reminders is suitable for your business. Obtain a USI for yourself and test that it validates in onCourse. Please contact your onCourse account manager if you need any assistance with this process. On enrolment through the office or the web, onCourse will send an email enrolment confirmation to the student. If the course is VET flagged, the confirmation template will include some text directing the student to obtain and supply you with their USI. Another default script in onCourse can be enabled to send a reminder email to students every Monday at 9am until the class is complete or the USI is entered. You can modify these templates or alter the script which determines when and how often to send these emails. Note that students are only sent this email if they are enrolled in a VET flagged class, to avoid bothering your students engaging in non-VET training, however by default VET flagged courses without qualifications or units will also trigger this email as they are usually reported via AVETMISS for funding arrangements. You may wish to alter the scripts to only send the email when the course has a qualification record attached. An example of a USI reminder email. 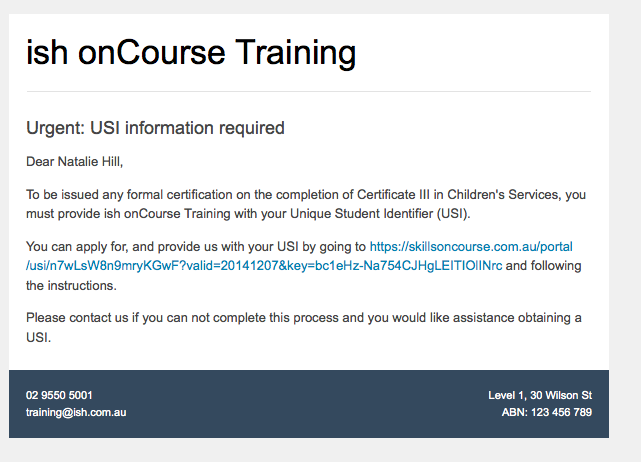 Once the student gets the email requesting their USI, they will be able to click on a link which takes them directly to a page within the skillsOnCourse portal. They will not require a password and the link will be valid for 7 days from the email being sent. The URL is cryptographically signed so that they will not work after the expiry date and they will not be transferable between students. You can change the default 7 days expiry to any number of your choosing by editing your enrolment confirmation and USI reminder email templates. The first step requests additional contact data not already captured on enrolment, that is mandatory for AVETMISS reporting or USI validation. No information they have previously supplied will be visible, only fields that are currently blank. This allows you, if desired, to collect minimal information during the online enrolment process and request the additional data be supplied post enrolment. 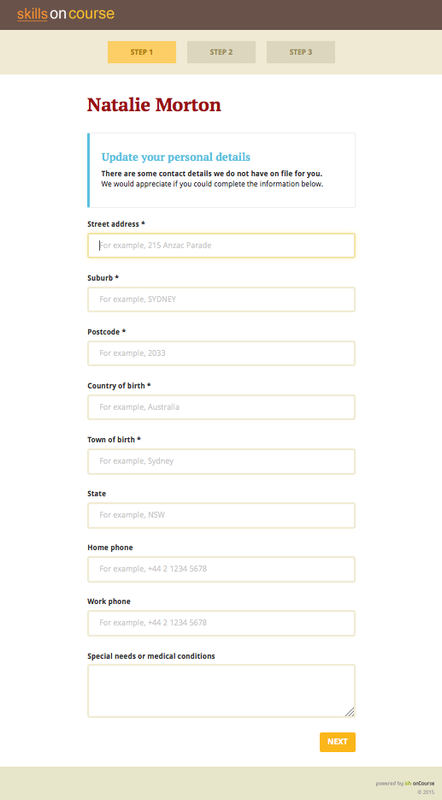 In the example below, the student is required to complete some mandatory fields such as their street address and country of birth, plus some options contact details such as home phone numbers. Previously supplied contact details like email address and mobile phone number are not displayed. Step 1: This is the screen the students will arrive at. Fields will only be shown if data isn't already supplied. The second step requests the student complete the AVETMISS questions. Responses to these questions are not mandatory but may be important for verification of student access to various types of government funding, for example, accessing lower student fees for Smart & Skilled funded programs. For each VET enrolment the student has in progress, they will be asked to complete a 'reason for study' question. Some students may have this question once, for a single enrolment, where other students enrolled in multiple programs. Step 2: The student completes the AVETMISS questions. The third and last step requests the student supply their USI. 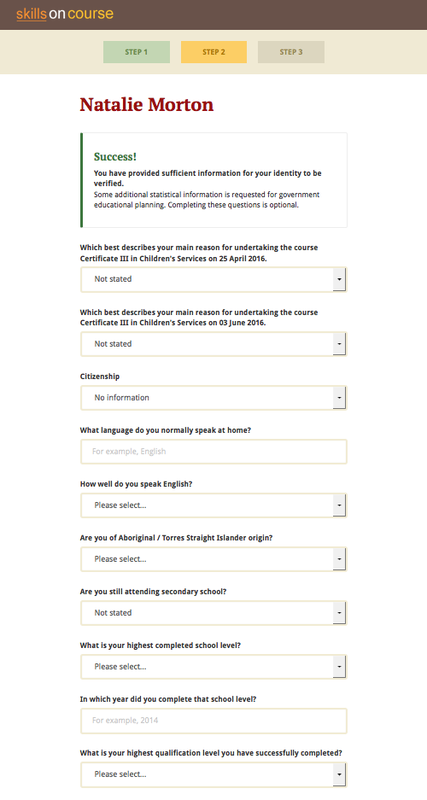 If their date of birth was not supplied on enrolment, they will be asked to enter this also. If the student doesn't have, or know, their USI, they can click on the link to visit the USI Agency website to obtain or retrieve it. On clicking next, the student's USI and contact details will be verified with the USI Agency. Step 3 in progress: While the USI is being verified they will see this window. If the USI agency reports back that the student's name is wrong (for example, they enrolled in onCourse with their maiden name but their USI is issued in their married name) then onCourse will give them the opportunity to fix this. Step 3 failed: The student's name doesn't match the USI Registry data. They have the opportunity to correct the data in onCourse. The USI does not need to be captured at the time of enrolment, but typically you'll want to have it entered and verified before the class is completed in order to not delay issuing of certificates. Some students will not be able to navigate the USI portal to obtain their own USI, in which case you are able to do this on their behalf in the onCourse student record VET tab. When there is no USI supplied, you can click on the link to open a web portal and create a new USI. If the USI field is blank you will see a link next to the field to create a USI. Clicking on this link will open a web portal where you can complete the student details and identity document information. You will need to declare that you have obtained permission from the student to complete this process on their behalf. An AusKey is not required to create a USI using the web portal. After creating the USI, you need to enter it into onCourse and the verification process will run. We do not recommend you copy or store the student's identity documentation in their onCourse record as this is in breach of the USI legislation. 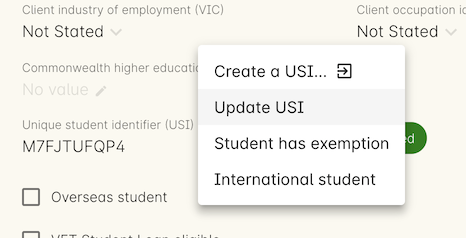 When you create a new student or update an existing one, you can type the USI directly into the field available on the VET tab in their contact record. This can also be done directly within the Quick Enrol process. The USI will be checked for validity (it is the correct length and matches a checksum) and then verified against the USI agency. What you will see if the USI has not been entered correctly. This USI is invalid as it doesn't meet the character length and checksum. It can't be validated and the record can't be saved. If you have an onCourse support contact, have supplied us with your AUSKey and registered your AUSKey with the USI Registry System the USI validation system in onCourse will be enabled. Once a complete USI is entered in the student record, the background validation process with the USI Registry System will run automatically. The validation process is checking that the student's first name, last name, date of birth and USI match the data held by the USI Registry System. If it succeeds the USI will be marked as verified with a green pill next to the USI field and the student's first name, last name and date of birth will become locked. This USI has passed verification and the record has been locked. If the one of the fields do not match e.g. the student's first name in onCourse is a shortened version of their legal name, then the USI verification process will fail. Hovering over the information icon next to the USI field label will show the reason why the verification process failed. You can update the non-matching data in onCourse and the verification process will run again, automatically, when you change one of the first name, last name, date of birth or USI field's data. This USI has failed verification. The data can be corrected and the verification attempted again. After successful USI validation, the data that was matched with the USI - the first name, last name, date of birth and USI of the student, becomes locked. On occasion, a student may inform you that they created their USI with the wrong name details and wish to update their records. To do this, they need to contact the USI Agency by logging into their own portal and completing the process to make the change. Once the USI Agency has the details of the change, you can go ahead and update their onCourse records to match. Click on the padlock symbol next to one of the locked fields in their record and a new sheet will open. This will allow you to edit one or more of the fields. 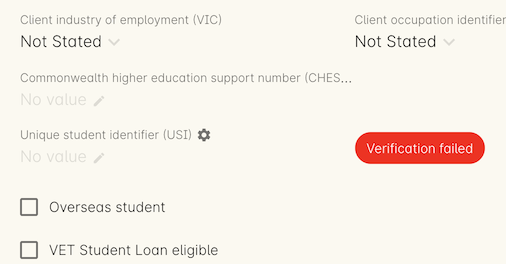 After editing, click on Verify USI and the SOAP call process will run and confirm if the students details with the USI agency match with the change you wish to make. If your change matches, the student record will return to it's locked state showing the new data that has been verified. If the student has not successfully updated their USI Agency record, your attempt to verify will fail and an explanation will be given when you hover over the exclamation icon. The USI details have attempted to verify with the new data, but have failed on the surname. There are two types of exemption currently available for students who don't want to, or can't, obtain a USI - international students who complete their training offshore (INTOFF), and students who have an individual exemption due to a personal genuine objection (INDIV). Check the USI website to ensure you have the most current information available about who is entitled to an exemptions and the process required for reporting. The record will update to inset the exemption code and marked the student's record as verified. This will allow you to print Certification. Should a student's exemption status later change, the cogwheel can also be used to remove the special USI status, so an actual USI value can be entered and verified. The USI legislation requires that RTOs only issue formal certification to students who have supplied a USI which has passed verification. From 1/1/2015 all certificate record print attempts will check the student USI status. A warning will show for any certificate print or reprint where the student doesn't have a USI. A certificate created after 1/1/2015 will not print without a verified USI. A range of warnings and errors will appear based on your onCourse access rights. By default, all non admin users do not have permission to print certificates for students without verified USIs. This certificate can't be printed as the user does not have permission to print without a USI. All admin users will see the warnings if a student doesn't have a USI or verified USI, however they will be able to proceed to print for all certificates if they choose. This is a warning only. You can still proceed by selecting print. All access roles have two optional levels of access - print certificate without verified USI (this means the student has supplied a USI that meets the checksum requirements, but for whatever reason it hasn't passed verification with the USI Registry System) and a higher level of permission, print certificate without USI. We do not recommend that you allow staff permission to print certificates without verified USIs. This access role does not have permission to print certificates without a verified USI. Why are all my USIs failing to verify with the error message saying the USI agency can't be contacted? For all the customers that followed the instructions we provided on our forum about creating an AUSKey, sending it to us to upload to your server and completing the USI Agency Access request form, it seems the last step went pear shaped for some and the AUSKey wasn't linked to your RTO Id, making the whole automatic verification process fail. How do I make the USI validation process run in onCourse? When onCourse detects you have entered a USI in the USI field on the Student VET tab, it will check that you have an RTO ID entered in your general preferences, and a First Name, Last Name and Date of Birth entered in the student record. If all these fields are complete, the USI Validation process will run automatically in the background. If it fails, and you need to change some of the data to make it try again, make the change, click out of the field (use tab on your keyboard, or click into any other field) and the process will run again. If you don't need to change any data, just click in the USI field and click out and it will try again. You can do this as many times as you like - the validation check is quite fast, less than 3 seconds in most instances, and there is no limit to the number of times you can try to validate a USI. How can I test that my onCourse USI portal access is working as required? Go and create yourself a USI. Then you can use your own details to create a new student contact and test the USI verification. 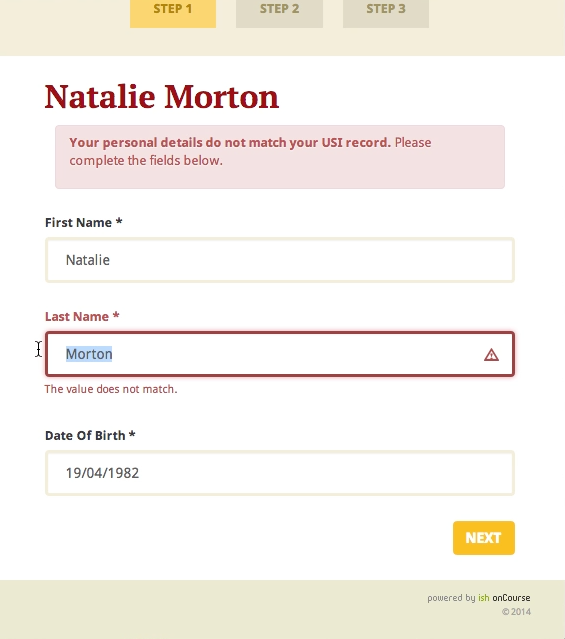 Try without a date of birth or misspelled name to see the error responses you'll get in onCourse. You can discard the contact instead of saving it onCourse after sufficiently testing the verification process. What should I do when the student has created their USI in a name different to the name they enrolled with? Commonly, students will enrol with the name they prefer to use e.g. Bob rather than Robert, but their USI will be issued in their legal name. When you try to verify the USI they supply against their name, an error will be returned telling you that the first name (or last name, or date of birth) doesn't match the USI you supplied. In that case, you can change the data in onCourse and the verification process will automatically run again. Of course, we have also had instances of students whose name is spelt incorrectly on their ID and therefore the name linked to their USI has the wrong spelling, or students who have enrolled using a married name, when the ID they used to create their USI was in their maiden name. You'd need to enter their name into onCourse as an exact match as their USI name to make it validate, but you probably don't want to do this as then their certificate will be issued in the wrong name too. For the time being, leave it as an invalid USI. 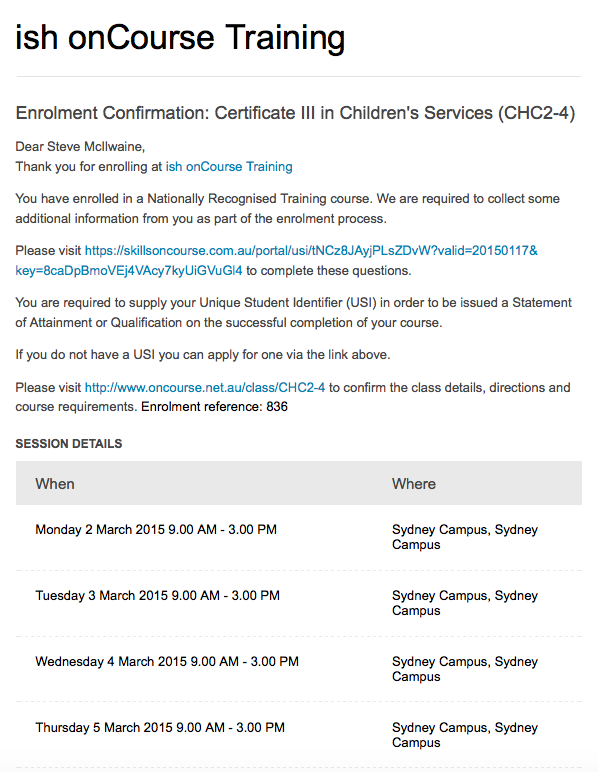 How can I find out which students USIs have failed to pass validation in onCourse? In the contact advanced search options, you can search for USI status = not verified. You can then work through the list of returned to results to check the error messages, contact the students and make the appropriate changes. As you change the data, the verification process will run again. 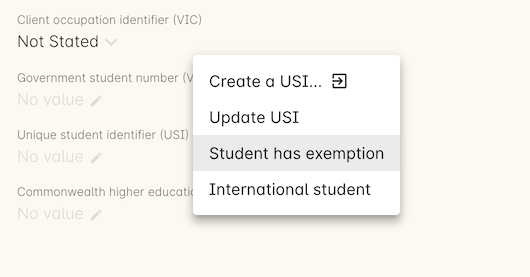 How can I find out which students need USIs but don't have one recorded in onCourse? Using the class window, locate all your VET classes that are running during 2015 and highlight them all. Use the cog wheel to find 'Enrolled students' related to the highlighted classes. To send the reminder email, select all the students and use the cogwheel to find related enrolments. 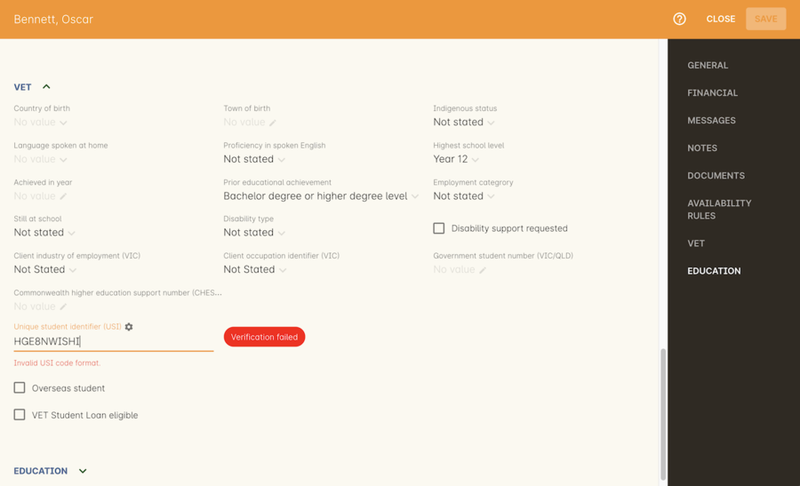 When the enrolment window opens, check the filter options 'current active' and 'completed active' to remove any cancelled or failed enrolments from the list. Then highlight all the enrolments and from the cog wheel choose the option 'send emails from template' and select the template called 'USI reminder email'. What happens when merging contacts with USIs? You cannot merge two contacts with different verified USIs. If you attempt a merge, a notification will be displayed informing you that you can't do this. If only one of the contacts has a USI, then they can be merged, but their First/Last Name and date of birth can't be changed during this process. How do I validate a student who has only one name? You can put their 'one name' into both the first name and last name field in onCourse and it will pass validation. For example, a student with a single name like 'Madonna' will be entered as first name 'Madonna' and last name 'Madonna'. Their certificate and other documentation issued from onCourse will be in the single name 'Madonna', and the AVETMISS files will export the expected 'Madonna, Madonna'. Some students are setting up their USI with 'one name' because they misunderstand the question in the USI portal. They think it means no middle name. 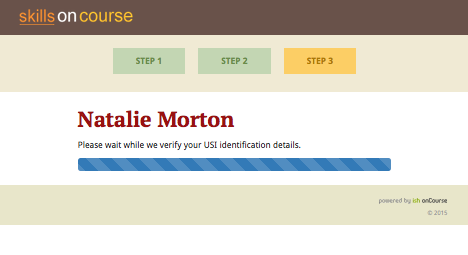 If you have a student with a name like 'Sally Smith' who has created their USI as one name, then you can record her as First Name = Sally Smith and Last Name = Sally Smith so her USI passes validation.